You’re attacked, but in your pocket is the most tactical weapon any fighter could ask for: sand. It’s coarse and rough and irritating and it gets everywhere. This non-dimensional pouch can be slapped onto any article of clothing to create a pocket that’s always filled with sand. There’s always enough sand for a perfect handful. Tipping the pocket over does nothing. Sand must be removed via a hand, paw, talon, or an equivalent. As a bonus action, you can throw pocket sand into the eyes of a creature within five feet of you. The creature must have eyes for the Sand of The Pocket to take effect. When the sand is thrown, both parties make contesting dexterity rolls. 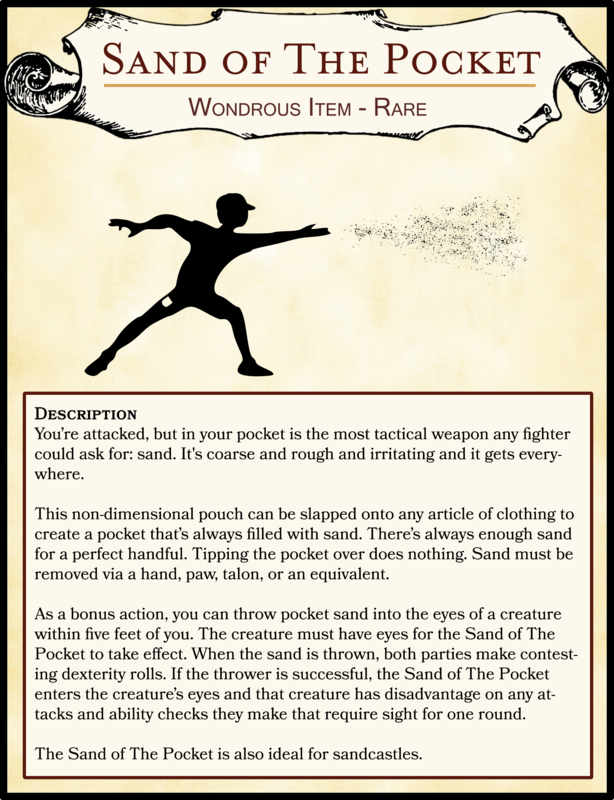 If the thrower is successful, the Sand of The Pocket enters the creature’s eyes and that creature has disadvantage on any attacks and ability checks they make that require sight for one round. The Sand of The Pocket is also ideal for sandcastles.